When we are young, we learn things like manners, social cues and social values and incorporate them into our daily actions to the point that we don’t even think about them. How useful would it be to have a collaboration and influencing framework, a tool to improve your social awareness to the point that advanced leadership skills become second nature to you? Today we’re going to explore one such model, the SCARF® model. The SCARF Model was developed by David Rock in 2008 and is described as a brain based model, as it leverages detailed neuroscience research. You can listen to us talk about it on our podcast here or read our twist on it below (or both of course). And if it sounds of interest, we’ve put together a 1 page SCARF Tracking Sheet to help you integrate the model into your behaviours. 1 - ‘Social threats’ are perceived by the brain with the same intensity as actual physical threats. 2 - When we are under threat, our ability to solve problems or make decisions or interact with others is diminished. When we are in a ‘reward environment’ our abilities are enhanced. ​3 - The threat response, or the desire to avoid pain, is more common and always outweighs the desire to seek pleasure. Thus the more pain we can avoid in social situations, the more effective we can be. These three themes unconsciously determine how we interact with others. They are at the basis of our decisions whether or not to approach someone or to avoid them. They help us to decide whether to be in a defensive mode or to be in a more aggressive mode with others. They are the unconscious tools behind our evaluations of ‘friend or foe.’ And they help us determine whether we will take social or professional risks or whether we will just settle for the status quo. In the context of leadership, knowing these three themes is relevant not just for our own conduct but also for how we lead others. As you’ll soon see, managers and people leaders are inherently ahead in the domain of ‘status.’ As such, they are more likely to be perceived as a threat by others. However, all hope is not lost. As a socially adept and ‘SCARF aware’ leader, you can use your status to put others at ease and feel motivated by your presence rather than threatened by it. Once you become familiar with the model, you’ll see that it’s very easy to apply to your work (and life) pretty much straight away. In a nutshell, the Status domain means that we are constantly evaluating our own importance relative to others. Keep in mind though, that it isn’t just position or hierarchy that may give someone status, it can also be information or knowledge. Someone who is ‘in the know’ may be perceived as having more status than someone who is not. The delicate balancing act for a leader is to always be on the lookout for opportunities to elevate the status of team members, either real or perceived, without making other team members feel like they are left behind. One key tip that we would offer is to make use of inclusive language where possible. When referring to your team, refer to them as ‘our team’ rather than ‘my team.’ Use terms like ‘we’ and ‘us’ rather than ‘they.’ While these may seem like minor semantics they do have a huge impact on how people perceive themselves relative to you. Be mindful also of opportunities to be more open with information about what’s going on within the business. The old saying, ‘what they don’t know won’t hurt them,’ isn’t actually true. From a status point of view, the pain of being left out can be real, just as the pleasure of being included is real also. You’ll know situations yourself where you felt some relief when you became more informed about something at work. As a leader you have the opportunity to provide some of that relief to your team members as well. As you’d expect, the social dimension of certainty is about being able to predict the future, or at least to have a sense of assurance about what the future holds. In some cases, certainty can give us pleasure, but more often than lot, it’s a lack of certainty that brings us pain. This is why change can cause so much angst, especially in a work environment. While many of us like the idea of change, fundamentally it carries with it some risk, some lack of certainty. Under the domain of status, we mentioned the value of being open to help overcome the barriers of status. In the domain of certainty, openness is even more critical. One thing we say is that you can't over communicate in the workplace, especially when it comes to change. When people say ‘we're getting too much communication’ then you're most probably hitting the mark and delivering the right amount. ​Keep in mind it’s as much about the style of communication as the frequency of communication that matters. Circulating emails is certainly one way to keep the flow of communication open, but wherever possible, try to find more personal avenues. ​Face-to-face interactions, texting, brown paper bag lunches, walk-and-talk videos… These are all creative avenues you can use that stand out from the usual emails or memos. They also show that you are serious about the communication and willing to put some effort into it. This in turn elevates the status of the recipient, which we already know is a good thing. Aren’t you loving this SCARF model already? While the domain of certainty was about predicting the future, autonomy is about having a sense of control. It could be control over events, over the work environment, or even over the choices we might have. In simple terms, the more choices you can give people, then the higher their level or feeling of autonomy is likely to be. More autonomy is pleasurable, less autonomy is painful. Performance reviews are a typical workplace example where a worker might feel a lack of autonomy. Believe it or not, feedback is perceived as a threat and triggers pain centres in the brain. Keep in mind that it takes trust to pull this off correctly. You don’t want your team member to feel like it’s a trap so to speak or a test. Present it as a genuine opportunity for her or him to make a valuable contribution to the process. ​Autonomy can also be given by empowering team members to solve their own problems. Often they might come to you with a question that has a hidden agenda. They may want you to make a decision about something because it takes them off the hook if it turns out to be wrong. Empowerment can come about by offering yourself as a sounding board while they explore the options then inviting them to go away and make the decision themselves based on their reflection. This has the added advantage of liberating you for more higher value tasks and contributes greatly to the development of a high performing team. Relatedness essentially equates to a sense of belonging and safety. Are you friend or foe? Do I feel a part of this group or not? Ultimately, do I feel safe or do I feel threatened? The critical function of the leader is to create a culture of trust, friendliness and confidence. Do the people on your team feel safe to share their thoughts, feelings, expectations and views about what's working what's not working? Do you encourage them to do so without fear of retribution or backlash? Do you cultivate friendliness as you move about the office? Do you engage with team members and enquire about their well being and life outside the office? Does your body language reflect that they can feel safe and open with you? Do you keep your eyes and ears open for signs of unfriendly conduct in the office and nip that in the bud? And do you inspire confidence in your team members? Do you acknowledge them publicly for work well done or for affirming conduct? Do you encourage people to speak up when you can see they may be reluctant to do so? People inherently mirror each other, especially those with leadership status so if you want to cultivate a culture of belonging and relatedness in your team, let it start with you. Be on the lookout also for signs of the ‘silo effect’ in your organisation. Teams often develop a sense of competition with other teams in the business, even though they are working towards the same goals. Foster a culture where your team strives to contribute the success of other teams in the business so that relatedness permeates the business rather than just your team. While it might well be true that ‘life isn’t fair’ that doesn’t mean that fairness isn’t a value worth pursuing. In the workplace, this boils down to the concept of having fair exchange between people, having the same set of rules and expectations of each other. Having an agreed set of standards among the team is a great place to start. If you don’t have one already, make that an agenda item for your next team meeting. Of course, you may also need to apply a bit of flex to the rules and standards from time to time, you may need to cut someone some slack due to a personal or professional context. Where appropriate, explain this to other team members, but don’t let it become normal conduct. All this does is lower the standards and compromise the fairness principle, which will inevitably cause pain in the team. Equally, fairness applies to reward and recognition. Do team members get acknowledgement commensurate with their actions or do you favour some team members over others? How do you apply the SCARF model? 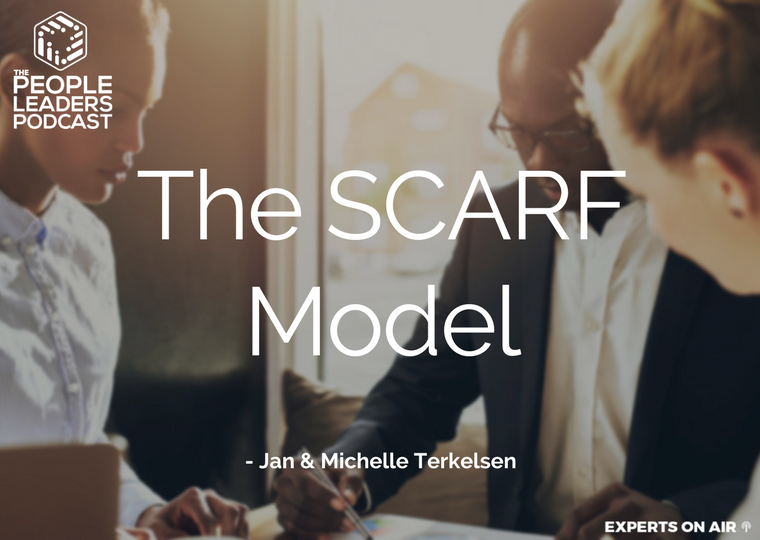 If we think of the SCARF model as a way of being rather than a tool as such, we can literally apply it anywhere in the business context, or even in life for that matter to be more influential and collaborative. It can be applied to our performance management systems. If we’re running appraisal interviews or team workshops we can touch on these points with our team members. When we’re dealing with internal or external stakeholders we can quickly run through the five domains and ask if we’re putting them to use. Being mindful is key to integrating the SCARF model. As you move through your life, as you move through the office, as you move through your day, just be mindful of the impact that you are having on others. And sharing the model with others on the team (and at home) and inviting everyone to support each other in putting it to use can be a great way to fast track it. You could even begin meetings by sharing the objective that you want to apply the SCARF model to the discussion and would like feedback at the end to see if you met that objective or not. To help you even further, we’ve created a simple 1 page SCARF Tracking Sheet that we invite you to download and print out (and share if you like). The sheet runs for 28 days and gives you the opportunity to bring your awareness to SCARF each day and to assess how you ‘performed’ each day in relation to each of the five domains. It will take less than 15 seconds to complete each day but will contribute greatly to the SCARF model becoming second nature to you. ​Please let us know how you go with this and feel free to listen to the podcast where we talk a little more about SCARF. Are you a ‘SCARF aware’ leader? Find out what that means and why it could be important for you and your team.